We had a turkey that we purchased for the holidays and never got around to making so it seemed like a good time to use it up. However with only the two of us that means lots of leftovers. 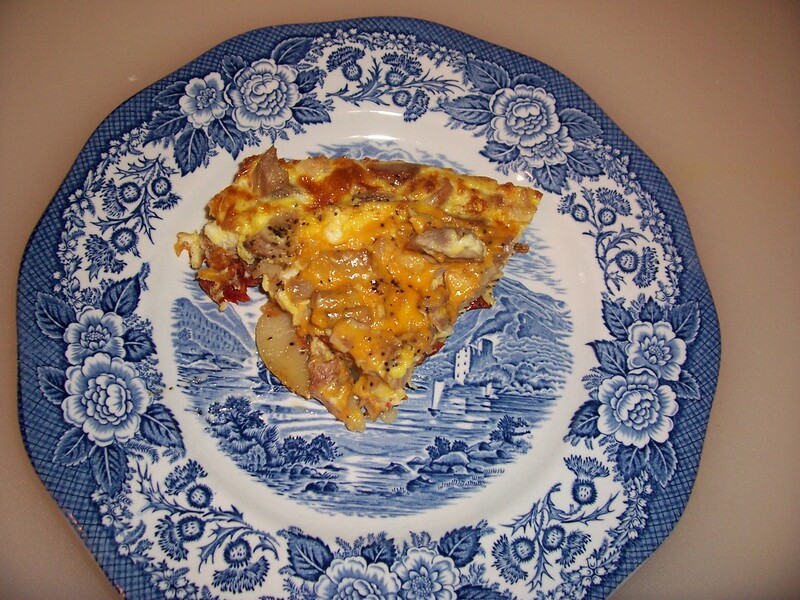 Turkey frittata is an uncomplicated dish that I use to basically empty the refrigerator of left overs. For this one I start with a 10″ frying pan and 2 or 3 Tbs.of butter. One can of sliced potatoes placed in one layer in the frying pan with salt and pepper and browned on one side then flipped and seasoned. To this I added a ½ of a red onion diced, a tomato diced, a few pickled peppers chopped up, 2 cups diced white turkey meat, four eggs with a little ½ & ½ added well beaten and seasoned and poured over all in the pan and then swirled to get into the nooks and crannies. Cook on stove top for a few minutes and then place into a 375° oven for 10 minutes or until center begins to firm up. Layer thinly sliced cheddar cheese or any cheese you want and turn the oven to broil and finish cooking as cheese melts and eggs become firm. Carefully remove from oven and loosen edges from pan and either slice, or slip a serving dish to present at the table. Serve with Sour cream.